***Note: We are currently having issues with our office space and so we are unable to utilize it. We still primarily meet in the Grey House, however, if you are booking an appointment where privacy is a concern, please let us know in your email and we will book a room on campus to talk with you. We apologize for any inconvenience. Location: The Grey House is located on Bader Lane between Harrison-LeCaine and Victoria Halls. Main Entrance: The main entrance is not wheelchair accessible. 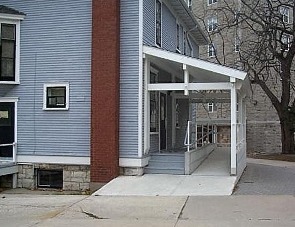 Accessible Entrance: The accessible entrance at the back of the building has a ramp, one turn and an automatic door opener. No Elevator: There is no elevator in the house and therefore only the first floor is wheelchair accessible. Washrooms: The wheelchair accessible washroom is located on the first floor, off of the kitchen in the back of the house. There are gender-neutral washrooms on both the first and second floor. 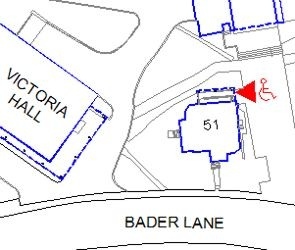 Parking: Permit parking is available on Bader Lane and in the lot beside Victoria Hall. There are two accessible meter spaces on the north side of the Stuart Street near the underground parking garage entrance. Access Champions is a volunteer staffed organization that strives to equalize opportunities at Queen’s University. Their service is open to anyone who experiences challenges or barriers on Queen’s Campus: you tell them how they can help you. Their services include guided tours, event support, and connecting people to other services and groups on campus. Assisting someone in finding a good route from one place to another on campus. Attending an event with a person who sometimes experiences social anxiety. Guiding a community member living with a mobility disability to a guest lecture. Helping a prospective student become familiar with disability services.